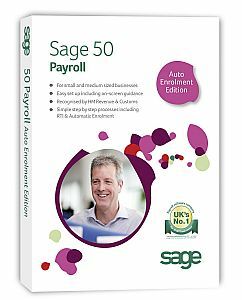 Sage 50 Payroll - Auto Enrolment Edition Software for up to 50, 100 or unlimited employees, with the option for Multi-User Network capability. The introduction of Automatic Enrolment Legislation means all businesses will have new legal duties to help their employees save for retirement. It will mean a big change to the way that employeess' pensions are managed, and the legislation carries with it a significant amount of administrative obligations.